Pont des Arts Bridge in Paris. 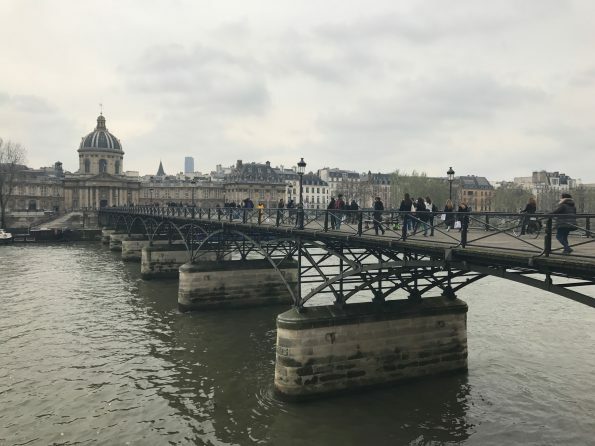 PARIS, FRANCE – I don’t know what it was that drew me to Pont des Arts. 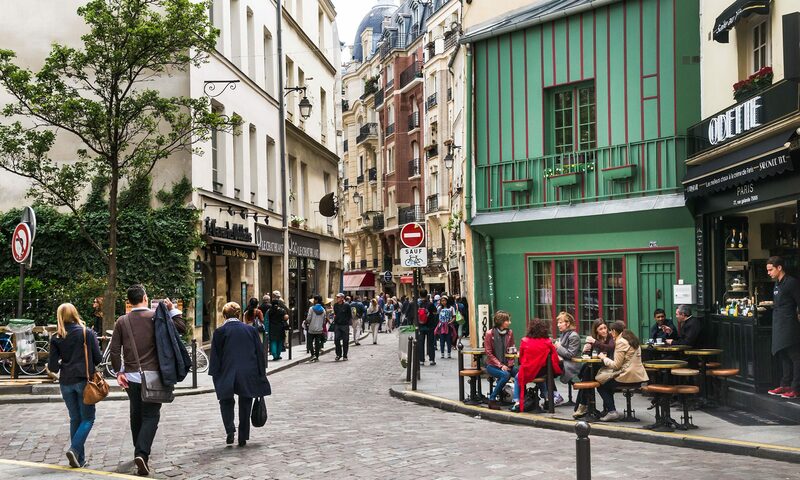 But that’s the magic of being a flâneur – a wanderer – of the streets of Paris. There are plenty of bridges in Paris – 37 to be exact – but Pont des Arts has a distinct reputation for romance. The bridge gained notoriety several years ago when it became a destination for lovers to lock padlocks onto its sides, symbolic of their binding love. The locks have now been removed and the grates have been replaced by glass, but the bridge retains its romantic glory. I came across Pont des Arts while I was walking along the Quai François Mitterrand on a sunny Friday afternoon. I was leisurely making my way to the Grand Palais to visit the newly-opened Auguste Rodin exhibition. I passed the central square of the Palais du Louvre on my right. 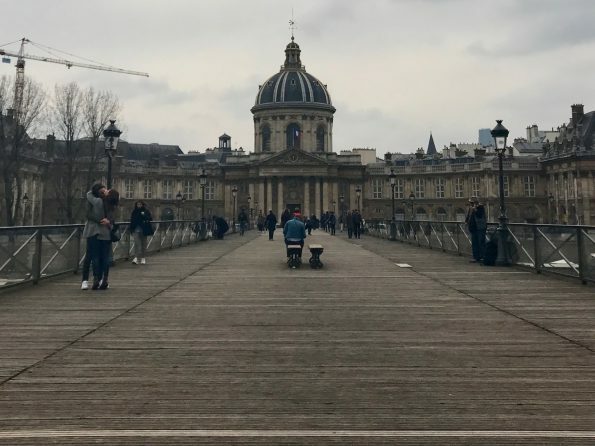 When I looked the other way, I came face-to-face with Pont des Arts. A flâneur is not bound by time, but is free to explore. She can choose to wander through a hidden market or take a detour through a charming alleyway. She can meander across a bridge with no pressing need waiting on the other side. I strolled between a peddler selling nuts and a photographer shooting several models dressed in Hunter rain boots and brightly colored raincoats. Tourists embraced their oddity and waved selfie-sticks in the air, trying to get their perfect picture above the Seine. The soft hum of a violin drew me further down the bridge. An old man stood by the edge of the bridge, slightly hunched over the maple-colored wooden violin, gently held in the crook of his arm. The shade of a tan fedora covered his face, and a pair of square, dark sunglasses hid his eyes. He was clad in a simple long-sleeved black shirt with an unzipped gray vest layered on top. On the outside, the man was by no means extraordinary. But the music that sang from his instrument was. I sat down on a wooden bench a little way from the violinist. I silently urged him to not notice my curiosity – I wanted to watch him in his natural element. His hand gripped the bow sturdily. When he brought the bow close to the violin, he let it only lightly kiss the strings. The violinist kept his head down, intently gazing at his instrument. It was if the world to him was solely composed of his violin and himself. A young couple holding hands approached. The girl had dark, long hair that spilled over her shoulders and onto her gray wool coat. She was a head shorter than the boy she was with, though without her black pumps, the height difference would have been at least a head and a half. The boy had tousled brown hair – though he was casually dressed in a pair of dark skinny jeans and white sneakers, he had an air of subtle confidence about him. His head was always bended down, softly speaking to the girl. Questions flooded my mind. Who were they? How had they stumbled across Pont des Arts? I made up stories in my head. Perhaps they had met as college students at Sciences Po. Or maybe in a quaint Parisian café. The couple approached the violinist and slowed their pace. The music captured them. Pedestrians walked by, peddlers hawked their goods, and car horns blared in the background. The boy wrapped his arms around the girl’s waist and hugged her close to him. The girl put her hands around his neck and brought her lips in close for a kiss. For a moment, to the fixed observer, the chaos of Paris halted. Surrounded by the strokes of the violin bow, he stroked her face and took it into his hands. A gentle kiss at first, then a longer kiss of passion. The couple kisses (left) as a violinist plays (right) on the Pont des Arts Bridge in Paris. The violinist played for his love of the instrument. The boy kissed for his love of the girl. The young man withdrew his arms and took up the girl’s hand again. They walked on and left the bridge. With gathered courage and amassed curiosity, I approached the bench directly facing the violinist. I tossed a few euros into his open case and he glanced up in acknowledgement. I sat down, and rested my chin on my hands. With an intent audience of one watching, the violinist played with more fervor and passion. A couple of passersby sat down next to me. They stayed for a minute, then continued on. The violinist finished the song. Antoine Laurent, one of the SOS Mediterranee rescuers. Photo courtesy of AFP / Gabriel Bouys. PARIS, FRANCE – When Antoine Laurent was learning to sail on the beaches of Brittany, he never imagined he would use those skills to save thousands of drowning immigrants from the banks of Libya. But all that and more is in 25-year-old Laurent’s job description at SOS Mediterranee, a nonprofit organization dedicated to saving the lives of fleeing migrants in the ongoing European Refugee Crisis. At the age of 17, Laurent decided to make the sea a part of his lifelong career. He began his studies at Le Havre to become a merchant marine officer. When he was 18, he interned at a shipyard for 3 weeks in China. But it was there that he saw the darker “backside of the industry.” Greed, corruption, and danger surrounded the beautiful waters. The sea didn’t change, but his perception of society did. Laurent quickly realized that there were significant problems in the world, but not enough capable people seeking to fix them. He began to yearn for a way to use his knowledge and talents for good – but the right time and opportunity hadn’t arrived yet. After four years of university, Laurent took a job at Louis Dreyfus Arnateur, where he charted oil fields before the drills would break ground. By 21, Laurent was successfully climbing the corporate ladder. He was the engine officer, running a ship with 300,000 euros on the line every day. One day, he found it. Enter SOS Mediterranee. Laurent discovered the organization after it issued a press release about its mission to offer maritime rescue to tens of thousands of immigrants fleeing their home countries during the Refugee Crisis. With his leadership and sailing experience, Laurent knew this was it. He had finally come face-to-face with his destiny. Now, his day-to-day operations range from checking equipment and planning the ship crew to helping the communications team and recruiting new partners. Despite his love for the sea, SOS Mediterranee needs him in Paris, where he is currently stationed. But his passion for helping others doesn’t stop him from missing the sea. 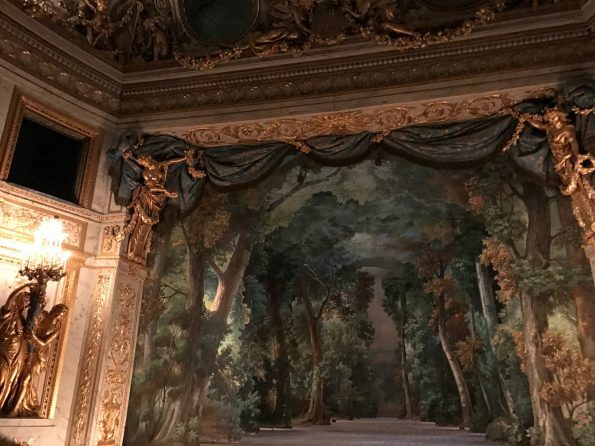 The private theatre of Marie Antoinette, one of the most luxurious renovations, in her chateau. VERSAILLES, FRANCE – In today’s Digital Age, the threat fake news is on the rise. But don’t forget, this isn’t the first time fake news has delivered real damage. It’s also a big reason the French didn’t mind taking Marie Antoinette’s head. 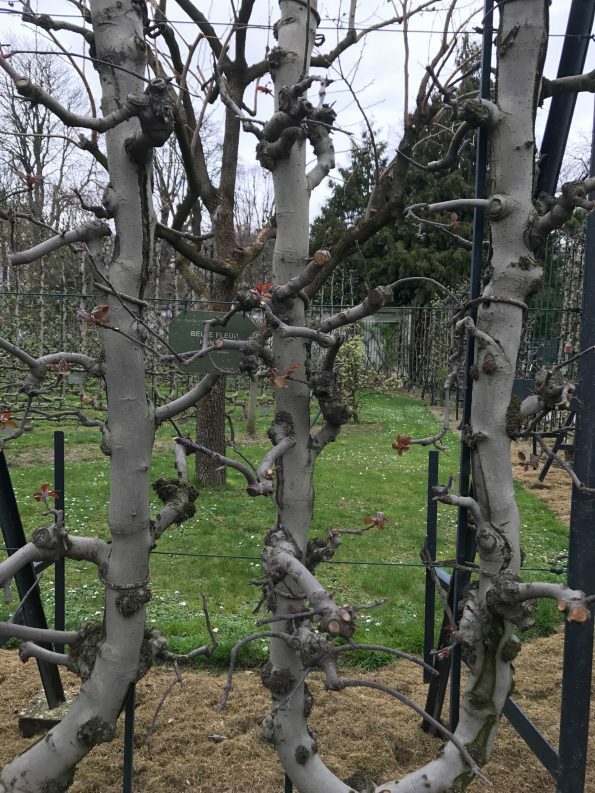 The scenic chateau of the famed French Queen Marie Antoinette is tucked away a mile behind the grand Palace of Versailles. The manor was restored by Napoleon Bonaparte in the early 19th Century. Today, the small palace serves as a memorial to its most famous accompaniment, Marie Antoinette. Traces of Marie Antoinette and the gossip that tainted her reputation remain scattered throughout the chateau. Marie Antoinette was born the Archduchess of Austria. At the age of 14, she was sent to France to meet and wed the soon-to-be King of France, Louis XVI. But Marie Antoinette didn’t get the memo: the overtly ostentatious lifestyle of Austrian royalty was very much out of style with the French proletariat. “She made mistakes from the very beginning,” said Bertrand Rondot, Chief Curator at the Palace of Versailles. When Louis XVI gifted Marie Antoinette the chateau, she set about redecorating the place – with little mind to budget. The “LL” medallions of the king were replaced by her own initials “MA” and baby eagles, the Austrian symbol, were added to décor sporting France’s symbol of the rooster. 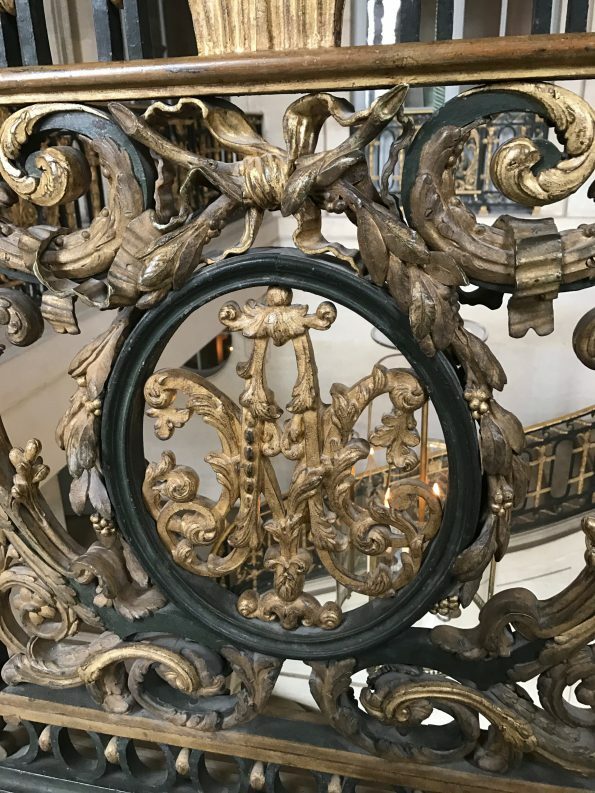 The initials of Marie Antoinette hidden in a metal medallion in her chateau. The new Queen ordered countless ornate furnishings. There were so many that her new purchases had to be systematically registered and organized by numbers. The total sum spent was so large that one of her servants burned the furniture records out of fear for the Queen’s life. 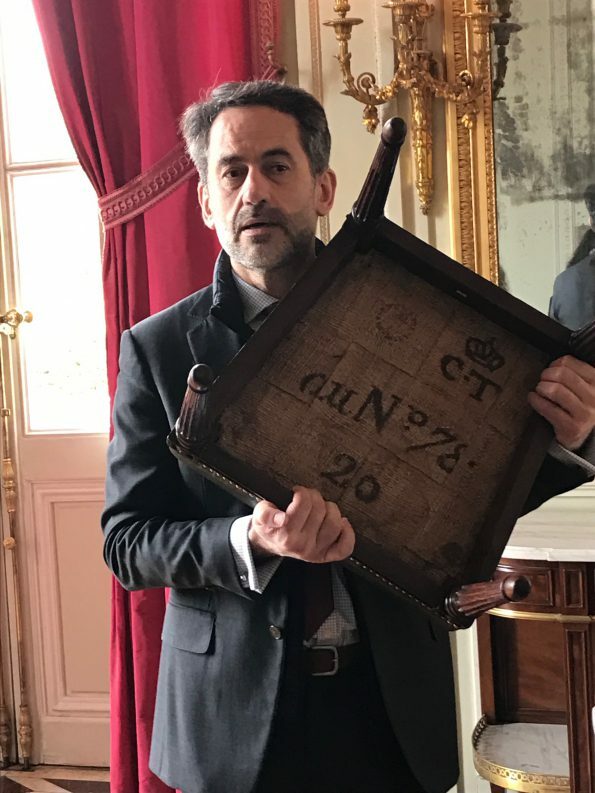 Bertrand Rondot, Chief Curator at the Palace of Versailles, holds up a parlor chair from Marie Antoinette’s chateau. A number to locate its spot in the chateau is stamp on the underside of the cushion. The front window of Shakespeare and Company. PARIS, FRANCE – Above the doorway of one of the quirky second-floor reading rooms of Shakespeare and Company, a portion of a bible verse is painted in capitalized, black letters. Now one of the most famous bookstores in the world, Shakespeare and Company took its name from Sylvia Beach’s original Paris bookstore that closed down in 1941 during the Nazi occupation. Since the 1951 opening of the English-language bookstore in Paris, the phrase has become the official motto of Shakespeare and Company. Its store owners, previously George Whitman and now his daughter Sylvia, have been dedicated to living it out. Every night in this reading room, the wooden benches below the walls of books transform into beds, and cushions and blankets appear on the floor. The reading room becomes a bedroom for the Tumbleweeds. Former shop owner George Whitman poetically claimed, “People who arrived in the shop blew in and out of the store by the winds of chance.” Whitman welcomed young, aspiring writers into the shop and invited them to sleep on the floors. In exchange for the free lodging, Whitman asked them for a few hours of work, a one-page autobiography typed on a store typewriter, and to read a book a day. These guests soon gleaned the name Tumbleweeds. Despite a 1990 fire that damaged the Tumbleweed room, 10,000 autobiographies still remain intact. Some of them include those of famous writers like Sebastian Barry (one of Ireland’s most famous contemporary writers) and David Rakoff (a famous Jewish essayist and New York City journalist). In Shakespeare and Company, Paris: History of the Rag & Bone Shop of the Heart, the recent book documenting the history of the store, Halverson and her publishing crew chose 25 autobiographies to include in the book. To make their choices, they read all 10,000. An unexpected discovery for Halverson? Finding the autobiography of her ex-boyfriend. “That was a surprise when I came across it,” Halverson admitted, laughing. He had come to the store in the early 90s “during that kind of Lord of the Flies time.” When George owned the shop, he didn’t bring any money to the bank, and instead let Tumbleweeds take turns sleeping on top of the money. “In the middle of the night, somebody came and pulled him up…and tried to get to the money. He fell off the bunk and broke his back.” Despite the heroic efforts to protect the money, “George was so mad about him getting injured that he kicked him out and told him he could never come back to the bookstore.” Eventually George softened and let him come back to the store to write his autobiography. Shakespeare and Company doesn’t want its “ANGELS IN DISGUISE” to be revealed, after all. 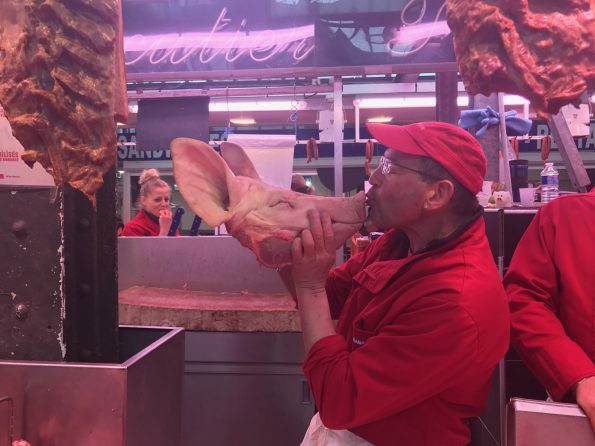 Marcel giving the famous “French kiss” to one of his products – a severed pig head. 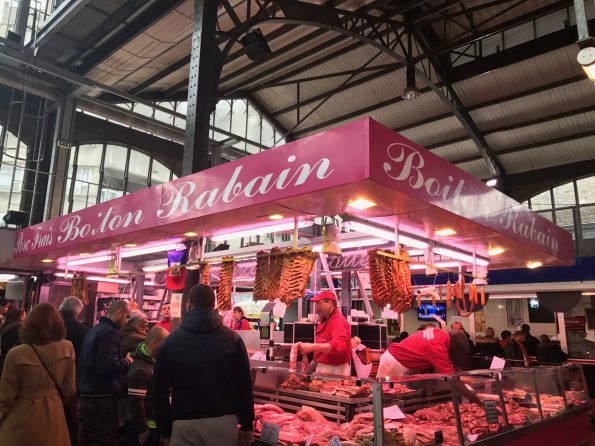 PARIS, FRANCE – “I am going to show you the French kiss!” isn’t the exclamation most American visitors would expect – or hope – to hear from a Frenchman yielding a bloody knife in Seine-Saint-Denis, one of the most dangerous spots in Paris. But Marcel, the butcher at Pore Frais Boiton Rabain, is a friendly guy. Marcel and his fellow butchers hard at work. Waving a small group of Americans over to his shop, Marcel is true to his promise and plants a big “French kiss” on the snout of a bloodied pig head. Pleased with the shocked laughter erupting from his audience, Marcel flashes a toothy grin and hands the head off to the young butcher behind him – who promptly begins whacking the head with powerful chops. He stoops down to pick up a chunk of ear that has flown onto the ground. 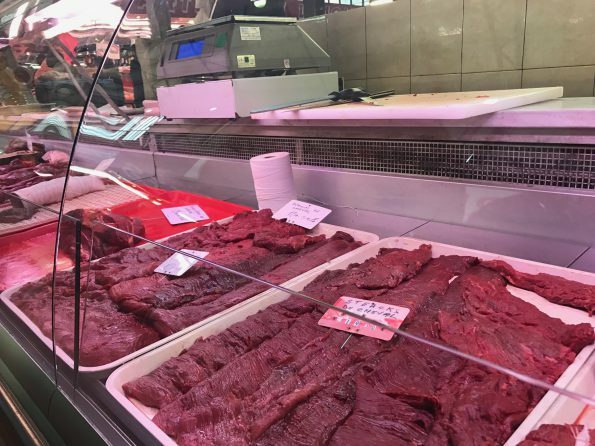 This market in Seine-Saint-Denis, nicknamed the neuf trois or 93, is anything but a tourist hub – the suburb is known for its unpredictable violent outbreaks and growing impoverished immigrant community. Booths ranging from bargain produce to 2-euro lingerie and 4-euro hijabs form a maze around the streets for Sunday shoppers. Alongside these merchants, butchers like Marcel add a gastronomic flavor to the marketplace. A few booths away from Marcel, at the Chevaline Lambert, is the fifty-two-year-old Claude. But unlike Marcel, who is one of many pork butchers at the market, Claude specializes in selling a unique product: horse. Claude has been slicing up horse meat for 12 years. His boss who works across from him at their other booth has been in the business for 41. Trays of horse meat at the Chevaline Lambert. The American troupe passes by his booth. They turn up their noses after they hear the English translation of the word cheval. Claude quickly reassures, “I have the best meat!” He rattles off his favorite reasons to buy – and eat – horse: it has loads of iron, no fat, and can be safely eaten raw. But Claude senses doubt in his visitors. He reaches down and tears off a chunk of raw, ground cheval. He offers it to a young American girl. “Try it!” Despite his coaxing, she manages to spit out the words, “No, no! Merci, monsieur.” Amused at her fear, he proves his point himself. He pops the bloodied meat into his mouth like candy and wipes his bloodstained hands on his white apron. The main course for a dinner at Miroir. PARIS, FRANCE – It’s 9:15pm and Paris is hungry – and many locals are craving their native French fare. For those near the Rue des Martyrs in the 18th arrondissement, Miroir, one of the last authentic French bistros, is the place to be on such an evening. The seats have been filled at Miroir since before 9:00pm, but that doesn’t stop a line of twelve from cluttering at the door. Despite the intimidating queue, passersby pause at the storefront to scan the menu taped to the glass door. Several pairs are won over and join the waiting party. Customers are greeted with the friendly bonsoirs of Chef Sébastian Guenard and his small crew – and by the intoxicating smells of wine and sweet broths. The restaurant name Miroir, French for mirror, is fitting. Several large mirrors with gold painted frames don the walls. A red leather booth lines the perimeter of the left wall; small, mismatched tables stand opposite of it. Many of them have been pushed together, morphing them into a makeshift banquet table for larger parties. Looking to the right, a wall of French wines stands. Slipped in between several bottles is a hardbound copy of The Only Street in Paris, a book by Elaine Sciolino of the New York Times. The book features Guenard and his bistro on several occasions. Tonight’s menu is an array of classic French cuisines. Slices of baguette and salami are laid out on wooden platters. They are shortly followed by cheesy puff pastries and fried seafood bites. Foie gras, a French delicacy, is brought out as a starter dish. What appears to be thin slices of savory butter adorned by slices of red beets and chopped green onions is none other than cuts of a force-fed duck’s liver. 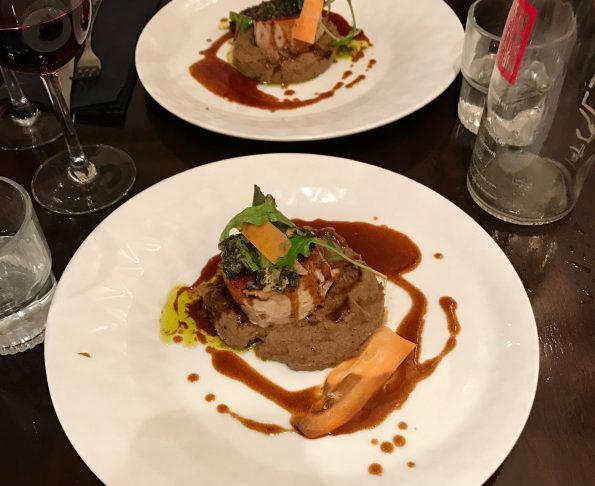 The main course, an impeccably cooked chicken with homemade broth and spices, is a crowd pleaser. The dessert, quenelle chocolat, closes the meal – it is a rich, thick mousse, drizzled with caramel and chocolate crumbs. The restaurant, from its menu to its décor – is unmistakably French. But these intricate French concoctions aren’t created by native Parisians. Rather, they are the creations of Guenard and his three immigrant cooks in a tight six-by-six kitchen. A tall, dark-skinned cook towers over a burning stove top, stirring and moving around metal pots holding different broths: chicken, mushroom, beef, seafood, pork, and cauliflower. His name is Lassana, and he is an immigrant from Senegal. He speaks little English on top of his French, but he tries to communicate with English-speaking diners through his fellow cook, Muhammad. After all, restaurant patrons are eager to learn the secrets of his culinary creations. Muhammad, an immigrant from Sri Lanka came to Paris to find work two years ago – and has been a cook at Miroir ever since. It’s the first day on the job for the third cook, Franky, another immigrant from Sri Lanka. Together, they give customers a taste of Paris. Chef Sébastian Guenard and his cooks are breathing new life into the French bistro.